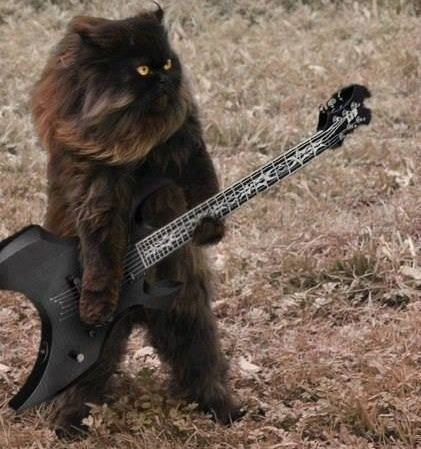 It should be obvious why Dark Metal Cat put one of today’s songs on the iPod and played it until the battery died. Now, while I’m linking to the other two songs, he’s listening to “Eye of the Tiger”. One of the facets of Children of Bodom I always liked was their ability to control their own chaos. Their rhythm seemed all over the place, but tied in nicely with intricate guitar solos and keyboards to add that extra flair. To add to all the madness there’s Alexi’s [mostly] unintelligible lyrics which I guess is a good thing because after reading most of the lyrics, I discovered a certain cheese-factor. But, if the words are lost in translation (through growling) who really cares as long as the music shreds right? I wasn’t terribly impressed with their last two albums, Blooddrunk and Relentless, Reckeless Forever. Needless to say, my expectations are low for their latest release, Halo of Blood. But, like most bands I have a fondness for, it’s hard to just stop buying their albums in hopes they regain the fire they used to have and create something…good. Let’s see where Halo of Blood stands. I guess it’s time to feature something new. 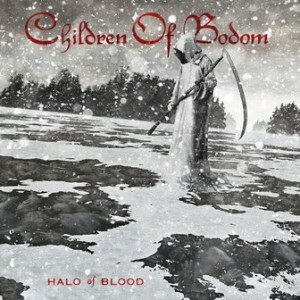 Children of Bodom released Halo of Blood yesterday and though I haven’t had much time to really check it out, I do look forward to seeing if there is any improvement. Not that I thought their last album, Relentless, Reckless Forever, was bad, it was better than Blooddrunk. I am not sure if that holds any weight in the grand scheme of things…but let’s move on. The title track of the album is presented before us as the Song of the Week. I have to say I am surprised by the aggressive intro to this song. It does level out a bit with traditional Children of Bodom melody, but the bursts of near Black metal riffs impress me. Overall, it’s not bad and I look forward to listening to the rest of the album in the very near future. What say you? Improvement, status quo, or a step in the wrong direction? Great vocals, atmospheric music and lots of diversity from a band that always had a huge potential. One of the best rock bands in the world. At least in my world. Children of Bodom is one of several well-known bands that records numerous cover songs; some quite good while others are just entertaining (see their Britney Spears cover). It’s hard to take the band seriously sometimes; they seem to joke around a lot with their music. Setting comedy aside, they covered Grammy winner Pat Benatar’s Hell Is For Children and did a great job with it. The song appears on the album Skeletons in the Closet released in 2009. The album of covers features Billy Idol, Suicidal Tendencies, and Slayer remakes to name a few. Their rendition of Hell Is For Children is their own, but still holds true to the original. I like it mainly for nostalgic reasons. When MTV first came out in 1981, Pat Benatar was one of a few artists that filmed videos which were on heavy rotation. There weren’t many videos at the time. I was 8 and I thought Pat Benatar was a cool rockin’ chick. I liked a lot of her songs. Little did I know she was setting the foundation for the metalhead I am today. I think it was her song You Better Run which was the second video ever played on MTV. Hell Is For Children was a controversial song (at the time) about child abuse. The song appears on the 1980 album, Crimes of Passion which remained on the U.S. album charts for 93 weeks. Just a tidbit, Pat Benatar was the first solo female artist played on MTV. Here is the original song by Pat Benatar featured on the album Crimes of Passion, 1980. Below is the cover song by Children of Bodom which is featured on the album Skeletons in the Closet, 2009. This year has been great for metal and I feel the best is yet to come later in the year, namely September 2011. 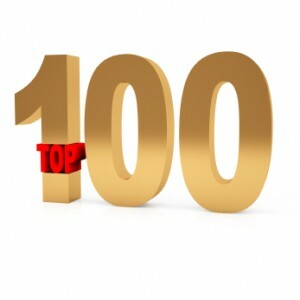 Housebroken did a great job outlining his top-10 for the first half of 2011. Let’s see how die-hard metal fans tastes compare and contrast. Here is my top 10 for 2011, January through June. I will keep this relatively short since I will be posting a full report on the Big Four sometime this weekend. What is your opinion of the standard thrash recipe? Do you think thrash as become weak over the years, stayed the same, got better, or a little bit of everything? Does thrash make you want to puke or snap your fingers…snap your neck? The theme for this week is going to focus on thrash from 2001-2010. Not so much the bands themselves, but the songs that define the music. I will cover the last 10 years with a few words on what’s out in 2011 already. Part II of this theme is that all the songs I talk about fit onto one CD-R. If you like the tunes I picked it makes for a great mix. I will let the playlist do the talking and by all means feel free to comment.